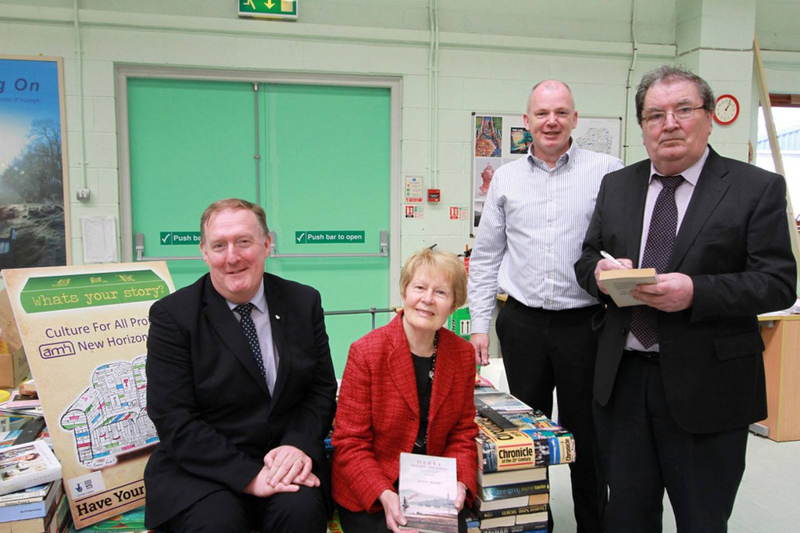 John Hume, Nobel Peace Prize Winner, former Politician and author visited our Foyle unit to lend support to our “What’s Your Story?” project for City of Culture 2013. John, his wife Patricia and Pat Ramsey MLA lent their support to the project and service Manager Mickie Harkin, with John signing his own book “Derry Beyond the Walls” and his biography by Barry White “John Hume Statesman of the Troubles” to be included in our sofa of books. Action Mental Health New Horizons, which helps people to overcome the effects of mental ill health and in many cases return to work, received a grant of £9,260 through the Culture for All funding programme, delivered and funded by the Arts Council of Northern Ireland and the Big Lottery Fund in partnership with Culture Company 2013.